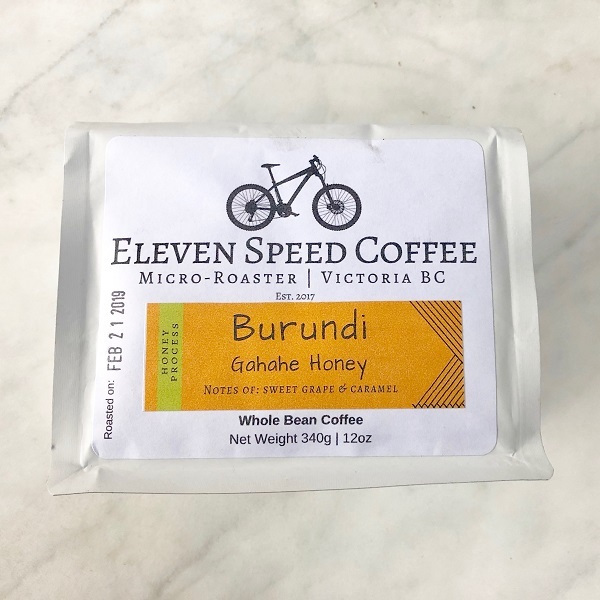 Eleven Speed Coffee is a Canadian craft coffee company from Victoria, British Columbia. This coffee is a single origin coffee from the small African nation of Burundi. These lightly roasted beans are a honey processed Red Bourbon varietal, that is clean, sweet, full of crisp fruit notes and creamy caramel. The Gahahe washing station promotes progressive farming practices, focusing on farmer education, and sustainability. Burundi happens to be one of the poorer nations in Africa, but this group of coffee farmers are doing their part to inject some economic action. A little crash course on coffee processing, most coffees are washed where the seed in removed from the coffee fruit. In a honey processing some of fruit or mucilage is left on the seed, creating a slight amount of fermentation and acidity. This can influence the flavor to be more sweet. Finally a natural processed coffee, is when the whole fruit is left to dried on the seed. These add more acidity to the coffee. As you can guess this is a coffee that’s more suited for a making as a coffee. As an espresso you would need to have a very specific taste for the sweetness. It’s was super sweet, and we do see the white grapes, but off the charts sweet. Again this is a lighter roasted coffee however, the flavor of beans really stands out. As a pour over it tastes sweet, and honey-like, and juicy. A very a well trained palate might pick up notes of apricot and tangerine. Most drinkers will get the white grape sweetness and even a sugary taste from a cup of this coffee. Special thanks to Eleven Speed for the coffee, visit them at www.ElevenSpeedCoffee.ca, and check back soon as we’ll have another one of their coffees up for review.